I was asked to present some specific cases. I won't have time to present all the cases I have written up for you, but they are in the handout. Neck torsion syndrome is particularly indicated for Tandem Point therapy in that many muscles need to be addressed on all sides of the neck. Such a widespread problem featuring interlocking muscle contracture can be very difficult to address with other techniques. I have read (but do not have the reference) that this problem is the most common repetitive stress injury afflicting the neck. With the widespread use of smaller and smaller cell phones, I can only expect this problem to become even more common. Symptoms: Loss of range of motion during rotation of the head; pain with rotation; other pain. Sign: With the head flexed, the C2 is rotated to the side. When caused by improper phone use, the C2 is usually rotated away from the dominant hand. Ipsilateral splenius cervicis, if necessary, plus Bl 63. Be certain that all agonist/antagonist pairs have been released. Discuss the value of headsets and stretching with the patient. I chose the following case because it allowed me to bring up both neck torsion syndrome and another common pain pattern, scalene syndrome. Source: Simons DG, Travell JG, Simons LS: Travell & Simons' Myofascial Pain and Dysfunction: The Trigger Point Manual, Vol. 1, Second Edition, Williams & Wilkins, Baltimore, p. 506. Reproduced with the permission of Lippincott Williams & Wilkins. 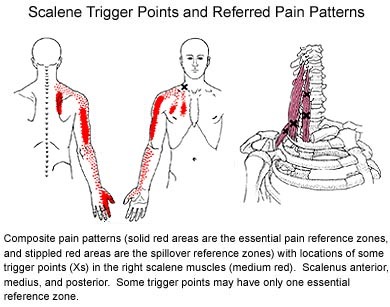 This graphic shows the pain pattern caused by trigger points in the scalenes. Travell and Simons note that this pain pattern can look very much like a disc or nerve problem, and often my patients with this pain pattern have been so diagnosed. Usually, but not always, when the scalene problem is addressed, often in one session, the patient's arm pain disappears also, suggesting that the root problem was the muscle, not the disc or the nerve. Case: Female, 41, high-tech executive. On Nov. 18, 1999, she held the handset of a phone between her ear and shoulder and injured her neck. She suffered intermittent shooting pains down her arm, along her triceps to the elbow and the dorsal hand. She had numbness at the tip of her thumb and pain with head extension. Her blood pressure was elevated. She saw her M.D. promptly, who recommended aspirin and rest. Her M.D. ordered an X-ray but no MRI. She was diagnosed with "pinched nerve, 4th-5th vertebra." Subsequently she received physical therapy, which involved stretching, traction, icing and electrical stimulation, followed by ultrasound and application of moist heat. Chiropractic treatment also helped. She also received massage; she had been told to get relaxation massage but what she received was deep massage to the back of the neck and the shoulders; this massage made her pain worse. The patient presented for Tandem Point therapy on December 19, 1999. By that time, her shooting pain was much less frequent. She still had neck stiffness. She still had pain with head extension. Physical examination showed C2 rotated left, consistent with the injury usually suffered by right-handed people who hold a phone handset between the ear and the left shoulder. Tandem point therapy was applied to eliminate trigger points in contralateral levator scapulae, ipsilateral levator, L and R medial and anterior scalenes, L SCM clavicular division. Following therapy, all neck and arm pain was gone, and the patient had a full range of motion. The patient still had numbness at the tip of her thump. The patient planned to drink plenty of water and to perform stretches per Travell and Simons. Follow-up by telephone on Feb. 27, 2000. Since treatment, with only one exception patient has had no referred pain, no pain with extension, and no pain with rotation. The one exception was she had pain once when she tried to look directly behind herself while sitting in a car. She then stretched her neck out, and the pain went away. She stretches multiple times every day. If she does not stretch for a while, some stiffness returns, and then when she begins to stretch again, she feels a "popping release" in her neck. The tip of her thumb is still numb. She does not know if her blood pressure has returned to normal.